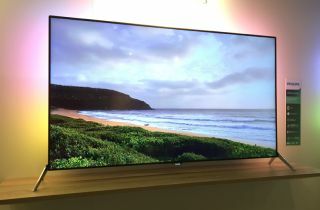 Philips 2015 TV line-up confirmed: 11 new models, including Full HD and 4K | What Hi-Fi? Eleven models, including Full HD and 4K TVs, are coming to the UK in the first half of the year, with top-end sets expected in September. TP Vision has confirmed details of Philips' 2015 TVs for the first half of the year. The entry-level and mid-range models will arrive in July or earlier, with 11 models confirmed for the UK. Seven will be smart TVs, which will come equipped with Google’s Android TV (5.0 Lollipop) – the most recent version of the mobile and tablet operating system optimised for televisions. In fact, Philips has confirmed that all of its 2015 smart TVs coming to the UK will carry Android TV. This brings with it plenty of potential, with built-in Googlecast capabilities, access to Google’s Play Store to download new apps and games and Google Voice voice search available (in some models). At the moment though, third party app support is rather limited compared to its mobile counterpart, with no sign of any UK catch up services currently on the Store. We’re hoping this improves before the sets’ expected release date of July, but built-in Googlecast tech does at least mean you can push the likes of iPlayer from a tablet or phone to your TV in the meantime. Gamers will be happy to see a good selection of games up for grabs on the big screen, including Asphalt 8 and NBA Jam, with more on the way, thanks to a partnership between Philips, EA and Gameloft. The entry-level smart TV model will be the 5500 series, available in 32, 40, 48 and 55in from July, with four Ambilight models above it – the 2-sided 6500 (32in) and 6510 (40, 50 and 55in) ranges and the 3-sided 6520 (65in) and 6550 (40, 50 and 55in). These Full HD models will be joined by two 4K models, the 6400 (40in, 50in and 55in) and a 7000 series set, the exact model of which is still TBC. All 7000 Series TVs include Ambilight, with the 7150 also packing a super-slim built-in soundbar. We’ll bring you the details of which model we’ll be seeing as soon as we get confirmation. Those not interested in smart TV will be covered by the more basic 4100/4200 range in a choice of 32, 40 and 48in, due in April, while smaller sets are covered by the 4000 and 5210, available in 20/22in and 24in respectively. As for Philips’ high-end 8000 and 9000 Series, we’re expecting to hear about them at IFA 2015 in September. We have had a sneak peek of some of the headline technology coming to them though, which includes HDR, new super bright panels and better motion processing. No official prices have been announced for now, but we’ll keep you updated with any information we receive.